Sasha Alston, also known as the STEM Queen, noticed a major hole in STEM-related fields: a major lack of women, particularly women in color, pursuing those career paths. Since then, she has made it her missions to cultivate an interest in STEM in women at an early age. She’s appeared on Good Morning America, been featured in the Huffington Post and Black Enterprise and has partnered with Disney, Google, Snapchat, and Yahoo initiatives to inspire girls to dream big. She’s also written a book to inspire young readers of color to pursue STEM, and is a sought-after speaker encouraging youth to pursue educational and career opportunities in STEM. It’s obvious that this STEM Queen is killing the game! Where did your interest in STEM stem from? I attended McKinley Technology High School in Washington, D.C. All students have to choose an aspect of STEM for an academic track, and I chose technology based simply on the fact that I loved my iPhone and iPad. I didn’t become truly interested until I had a Microsoft internship in the AthleTech Division the summer before my senior year, where my team successfully used coding to create a gaming app. Why do you think it’s so important to encourage that interest in other girls? I’ve noticed that there aren’t enough girls involved in STEM-related activities, especially girls of color. Less than 1% of high school girls say they’re interested in pursuing a computer science degree. 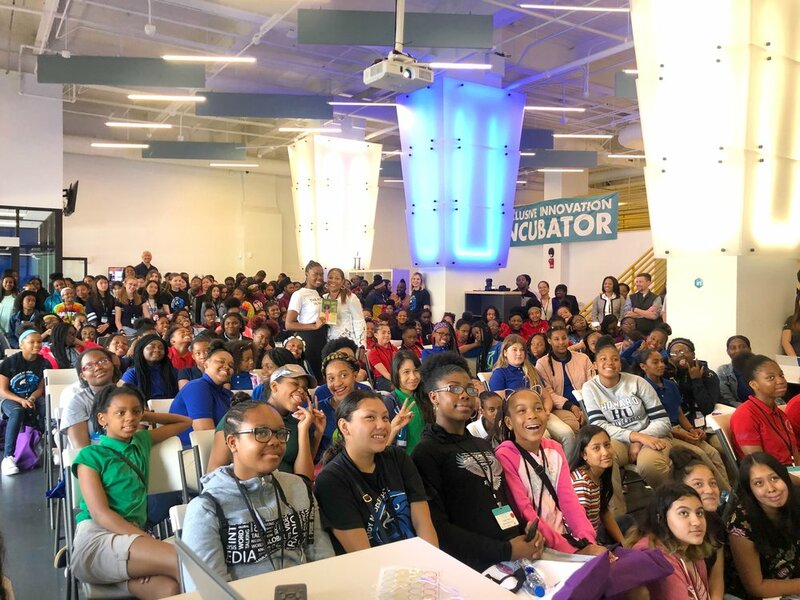 One of the reasons why there is a lack of girls interested in STEM, specifically coding, is because they are not exposed to it in school or at home. I want girls to know that they can choose any career they want, despite their gender or race. Raising interest in STEM should be done at an early age. Hopefully, girls hearing from me, a young woman who likes fashion and music just like most of them, but also thinks coding is cool, will make an impact. You wrote a children’s book to help get young girls interested in STEM. How did you come up with the story? Sasha Savvy Loves to Code is an early reader children’s book. The main character, Sasha, is a super smart, 10-year old African-American girl who lives in Washington, D.C. Sasha decides to give summer coding camp a chance. Sasha’s mom, a software developer, gives her a unique formula to help her remember how to code. Despite the formula, Sasha encounters challenges with getting her code to work on the first day of camp and gets frustrated. She must use problem-solving skills to figure out what to do. This book is based on a lot of things I’ve experienced, but through the eyes of a 10-year-old. How else are you working to increase interest in the field in the younger generation, and what can others do to help? Outside of writing the children’s book, I spread the word about the importance of STEM in interviews during speaking engagements, and provide resources and tools to excel in coding on my social media channels. What advice do you have for young women who might be a bit intimidated by this field, or might be interested but unsure where to begin? In STEM-related classes and clubs, there are always very few women. It is challenging to be in situations when you don’t see people like you reflected in the group. More women role models are definitely needed, so I became one myself. As an Information Systems major, I’ve faced a few challenges in my coding courses. Coding requires a lot of focus, studying, and practice. Although I already knew the basics in Java when I began my major, it was still very difficult to learn. It can be frustrating; sometimes I wanted to give up, so I had to be very disciplined and determined. The governor of Arkansas bought 900 copies of my book as a part of Arkansas’ Reading and Computer Science Initiative. Each book was placed into elementary schools throughout the state. When I visited six schools there, I was presented with the Arkansas Traveler Award, an honorary title bestowed on notable individuals who, through their actions, serve as goodwill ambassadors for the state of Arkansas. What are your top goals post-graduation? I received a grant to start the STEM Queen Academy Immersion Day. SQA participants will receive instruction in career options in the technology sector, as well as in the practical uses of technology-based knowledge in various industries. The girls will also receive training on soft and life skills to help guide their personal, academic and career development. After graduation, I plan on growing this academy into a weekly summer course, work for a reputable Fortune 500 company/startup, and gain skills to have my own education technology startup. “Whatever the mind of man can conceive and believe, it can achieve.” - Napoleon Hill. If you believe that you can do something, then you are more likely to succeed because you are motivated and determined to reach your goal.